Meandering is one of my favourite occupations. Traffic chaos pushed me into a splendid voyage this week. One of the new Routemasters enabled me to skip off the bus and walk away from the traffic jam. So I sauntered across Regent Street, through Soho, popped into St Giles in the Fields church (just because it is beautiful) and arrived at the British Museum. Once there I turned right into the shop, passed by the winking, tempting jewellery and through to Room 2A for the Waddesdon Bequest. Baron Ferdinand Rothschild died a rich but lonely man in 1898. He was fearful that his magnificent collection of art would be scattered to the four winds and so left his stash of medieval and Renaissance treasures to the British Museum, provided it was all displayed together. Until now they have been housed in one of the lesser visited corners of the museum but a fresh tranche of Rothschild money has seen them housed in plush new surroundings complete with wi-fi. 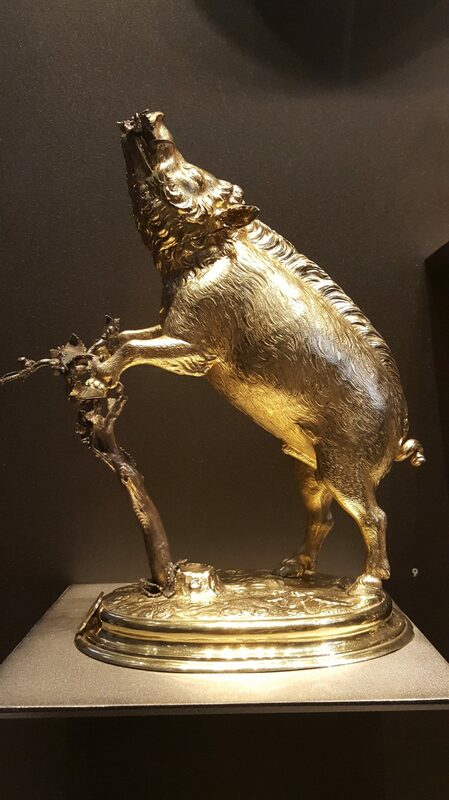 What caught my eye first were a series of silver gilt animals; stags, unicorns, cockerels and a boar. Quite nice but why? Closer inspection reveals them to have been the fashionable choice of drinking vessels among European nobility. The heads flip back and hey presto a cup. The wild boar one smelt strongly of cherry brandy when it first came to the British Museum. All manner of glittery altarpieces, jewellery and vast chunks of carved rock crystal can be seen in Room 2A. 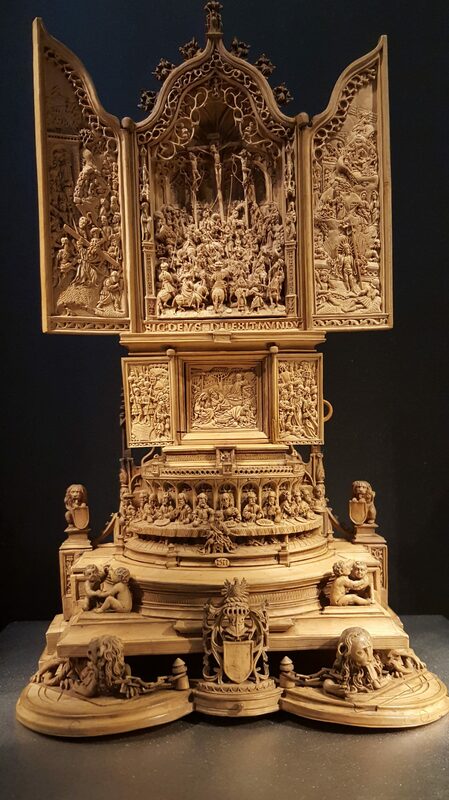 Dowdier but far more intricate are a series of boxwood carvings. Biggest of these is an altarpiece that folds out to reveal the passion, crucifixion and resurrection of Christ. 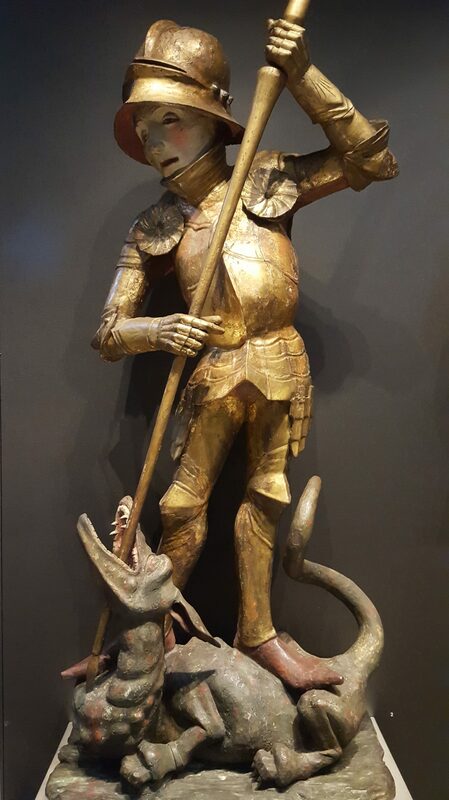 Keeping to the Christian theme, tucked at the back is a rather fine fifteenth century depiction of St George. Meandering through Soho caused me take my coffee and matching éclair at Maison Bertaux on Greek Street. I first stumbled upon London’s older patisserie thirty years ago and it remains one of my favourite coffee venues. We actually live about 30 mins from Waddesdon Manor – I’ve toured the grounds but I can’t wait to go back and see the actual house. I’m a bit embarrassed to admit I haven’t been to the British Museum yet either; another thing on my ‘To-Do’ list! Is St Giles in the Fields where they have the Christmas carols each year? Waddesdon is lovely. I think that St Martins in the Fields is the place for carols. Both amazing churches. St Martins next to Trafalgar Square and St Giles in the shadow of Centre Point.